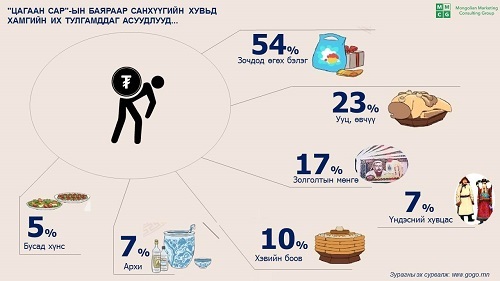 What does focusing on gifts given and received during the Lunar New Year tell us about the general economy in Mongolia? Last year we posted our first Lunar New Year Gift Index (LNYGI) and found that the slowing economy shaped how Mongolians celebrated the holiday, with people confining the celebrations to fewer days and opting for more useful gifts (like socks) that support Mongolian businesses. This year, Mongolia’s economy has been shaken further with pressures of increasing public and private debt and the slowdown of commodity prices globally. We found that people bought less over-all in preparation for the Lunar New Year. While prices have decreased (especially the price of meat), the cost of this year’s celebration was very straining. This was especially true for those without a regular income, or dependent on the sale of meat for money. The cost of preparing and sourcing goods was compounded by an already difficult time economically, and many pensioners used their pensions to take out loans, or purchased items through credit to fund the celebration. Based on comparison of our different cases, it seems typical for a lower-income household to spend less than 600,000 tögrög; a middle-income household to spend between 600,000-800,000tögrög; and high-income over one million tögrög. If a household has elders or highly-respected individuals, such as a doctor or singer, they often have to spend well over one million to accommodate the large number of guests. Though households might receive a good amount of money in the form of cash gifts given by guests (around 100,000-400,000), this does not seem likely to off-set the cost of items like vodka, prime cuts of sheep meat, gifts for guests, and holiday outfits that are purchased in advance of the holiday. Average Lunar New Year expenditures based on age group. Courtesy of Mongolian Marketing Consultancy Group. Alongside our reflections we have interspersed the text with statistics from the Mongolian Marketing Consultancy Group’s survey on people’s attitudes toward the Lunar New Year (with kind permission from Bumerdene Dulam). Although these are based on very general reflections, they complement the individual experiences we recount. They also reveal rising public interest in the high cost of the holiday. Based on her ongoing work with traders at Narantuul market, Hedwig noted that the market was, as usual, packed in the lead-up to the National holiday, and especially so in the last three days of the previous lunar year. The sellers were happy to be busy, but many remarked that over-all spending was much less than usual, and was characterized by ‘scattered’ and ‘irregular’ purchases (таруу). 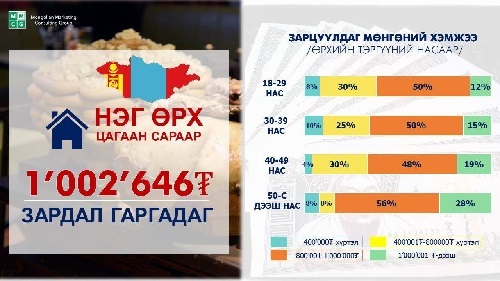 In fact, the average trader made 30% less than last year selling goods for the national holiday Those who sold household goods (ariun tsevriin hereglel) encountered a decrease in comparison to last year in spending of around 10 %, as people bought gifts like shampoo and soap from their shops, as well as products to clean their homes before the celebration started. Clothing shop traders (i.e. non ‘necessary’ goods) reported a loss in profits of between 30-50 % compared to previous years. Instead of purchasing new clothes, many reported using old material to make their New Year outfits, or simply reusing what they had. Others reported re-gifting items they had received, while also being strategic about whom they visited. Another person described how one of her relative’s took out her monthly pension allowance in advance with her husband. ‘They took out all their monthly pensions until February 2017, and [they] still don’t have enough money to celebrate Lunar New Year,’ causing them to ask their family for more money. It is clear that while many are already in debt, they allowed themselves to get further into debt in order to celebrate the occasion in a way they had been used to before. 45% of people take out loans for Lunar New Year. 73% obtain a loan from the bank, and 24% obtain a loan from individuals. Courtesy of Mongolian Marketing Consultancy Group. One member of our research group was in charge of arranging Lunar New Year for her elderly grandmother, given that her mother and other older relatives were abroad during the holiday. She was given a budget of 1 million tögrög ($490) to procure necessary food items and 100,000tögrög ($49) broken into crisp, new 5,000 tögrög bills to give upon guests’ departure. She was able to spend just under 1 million tögrög to purchase foodstuffs like meat, vegetables, pickles, eggs, mayonnaise, traditional dairy products, fruits, candies, ul boov (large foot-shaped cookies for an offering plate), wine, vodka, and juices. She was able to save some money because she was directed to only serve ‘dal durvun undur’ – the long four ribs of sheep – on the table, instead of purchasing the expensive sheep back and fatty tail. Many other people we talked with also remarked that they excluded this cut of the sheep, due to its expense. Different types of meat offerings purchased for the holiday. 50% of households interviewed serve the fatty tail of the sheep, the most expensive cut. 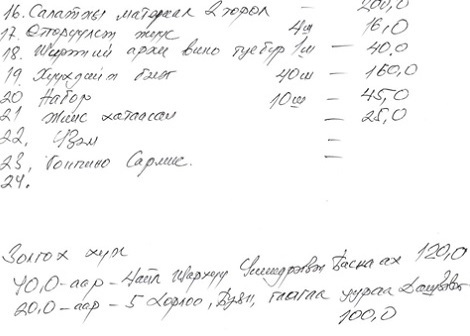 Anticipated Lunar New Year expenses for a household in rural Mongolia. Gifts make up a large part of the budget. Courtesy of G. Munkherdene. A friend of Lauren’s, who participated in last year’s LNYGI, shared that he is still most appreciative of the Mongolian-made gifts that he received. In particular, he really liked receiving a shirt made by the Mongolian company, Oulen (see image below). He was not particularly pleased, however, about receiving Russian-made gifts. One of the more interesting gifts that he received was a set of bowls made by the Russian-Mongolian ‘Ulaanbaatar Railway’ painted with socialist-era themed images. He explained that the bowls used to be in many homes in Ulaanbaatar in the 1990s, thus they have a nostalgic appeal. Like others we have spoken to, this man chose to visit fewer families than in past years, and also chose to only greet elderly people with money gifts. According to his observations, other people appeared to be doing the same. Gifts received by a young man in Ulaanbaatar. Photo courtesy of D. Javkaa. Hedwig encountered further forms of strategizing to avoid paying for lavish gifts. For example, many younger people avoided visiting extended elder relatives in order to avoid having to give money. And while some found the cost of giving gifts straining, forms of conspicuous consumption were also prevalent. For example, while many said that they prefered gifts made-in-Mongolia, gifts from other countries were given as a form of status. One household that Hedwig visited, for instance, gave honey and tupperware and facemasks from South Korea, and another gifted British-made shampoo and shower gel. While made-in-Mongolia socks were prevalent gifts, many people commented that the gifts should be ‘useful’ (kheregtseetei /tokhiromjtoi), including objects like cup sets and gloves. One research team member was surprised when she visited a well-to-do household serving non-traditional food offerings, such as egg-fried rice, fried mushrooms, and glass noodles with vegetables. She found it to be a nice break from the traditional offering of Russian potato salad and dumplings. When she left that household, she was given a gift bag of French-brand cosmetics, a luxurious gift that she heard other people received from wealthy families (other gifts of this nature include cashmere clothes and bed linens). Another of Lauren’s friends, a man 34 years of age in Ulaanbaatar who has a low salary in state-run office, multiple-side businesses, and a high mortgage that he can barely pay, reflected that he could not afford to visit many families this year and that many people are trying to take out bank loans to finance the situation. More ‘traditional’ forms of celebrating have been promoted, resulting in more conservative festivities, as a direct reflection of the economic downturn. Indeed, the economic strain of this year’s celebration even prompted one man in Dalanzadgad, Omnogobi to write on their facebook profile: ‘Because of the financial crisis this year, [we will] make mantuun buuz for Lunar New Year.’ Unlike regular Lunar New Year dumplings, mantuun buuz are made with yeasted dough and usually contain less meat filling, thereby providing a less expensive way to fill-up the stomachs of guests. While his comment was made in jest as a form of social critique, it suggests public concern about the affordability of the holiday in the current economic climate. The Lunar New Year seems to be a big financial burden for the elderly. The older you get the more people you receive to your home. The more prestige you are granted, the more of a financial burden you have to shoulder. The kinds of gifts a family gives are also indicative of its economic standing and networks, and the kinds of gifts you are given indicate your closeness or distance to a particular family member. The fact that some families can afford to engage in these displays of wealth while others cannot is well-recognized and perhaps epitomized in the phrase: ‘if you are rich in something, offer it to others’ (yougaar bayan tüügeeree dail). Perhaps this holiday was as much about displaying wealth as it was about distributing wealth and sharing resources across generations and groups of friends. 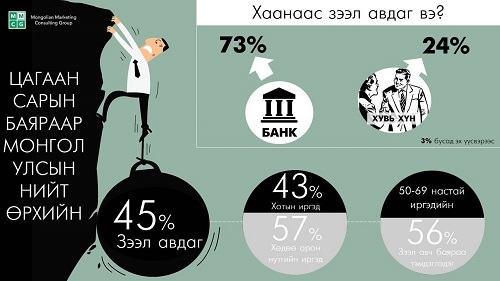 For other statistics and excellent diagrams, see the Mongolian Marketing & Consulting group and their facebook site.